It was time to have “the talk.” We both knew it. Max’s sunken shoulders said everything his quivering lips couldn’t. We’d just gotten home from a fourth night of training, and our drive on this rainy and cold night was a bad one. They were all bad, actually. The practice fields are 35 miles from home, and it’s typically an hourlong drive through rush-hour traffic. The 90-minute training session is probably the easiest part of his day. After school, he jets home for a quick snack and gets into the car. The only window to do schoolwork is after practice — usually for two to three hours after a shower and dinner. Five months of this routine had taken its toll on my then-15-year-old son. Soccer, the game he’d played since before he could walk — his Jamaican soccer-mad dad used to roll a miniature soccer ball on mom’s pregnant belly — was hardly fun anymore. It felt more like a job. “Honey, we can talk about this tomorrow — it’s late,” my wife told me as I tried to engage him in conversation. Max stood there, hunched over on the kitchen counter, his eyes welling up and pellets from the AstroTurf field falling off his loosened cleats. The boy was hella tired — we all were. Malcolm Walters, Max Wright and Sean Suber of the Carolina Rapids. “The talk” was almost exactly two years ago. As a player in the U.S. Soccer Development Academy (“DA” for short), Max is in the top tier of youth soccer in the country. As he’s gotten older, playing on too many teams to remember, and has grown in stature and in ability, soccer has become a real option as an avenue to college. Now almost 17 and a rising senior, Max is a center forward/midfielder on a U16/U17 team that earned a playoff spot in the recent DA Summer Showcase and Playoffs competition in Oceanside, California. Being there, particularly as a playoff team, was a big deal for Max’s 5,000-member Carolina Rapids Soccer Club, which hasn’t fielded a playoff team in five years. 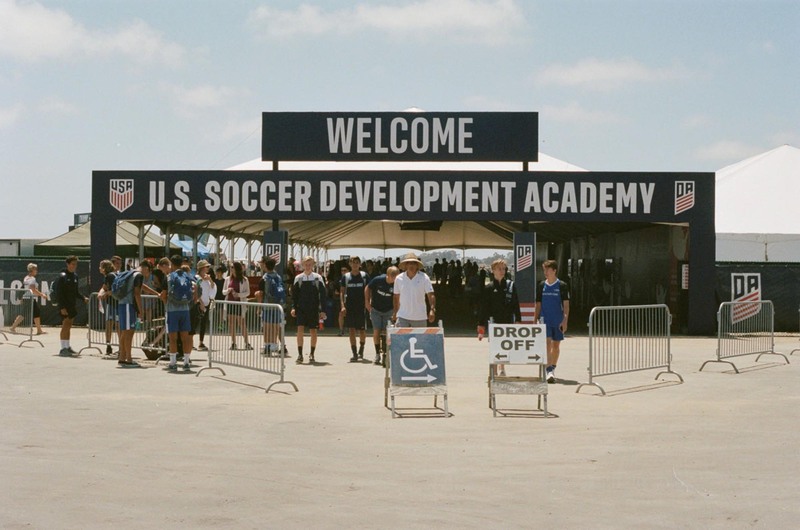 Crowds of players and their families come in and out of the entry way of the 2018 USSDA Showcase & Playoffs at the SoCal Sports Complex, Oceanside, CA, June 19, 2018. 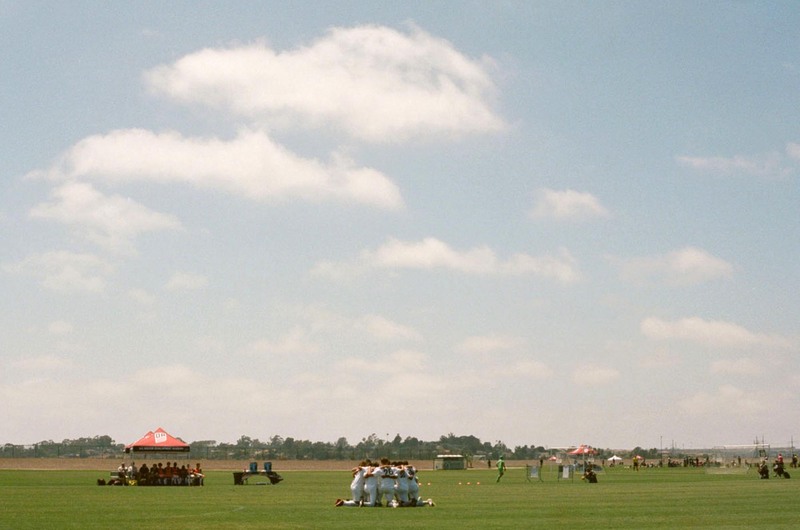 The venue, SoCal Sports Complex, has 22 full-size fields across 52.5 acres. Imagine a large airport — and then replace the roads and runways with perfectly lined fields. The Summer Showcase is the equivalent of the NFL combine. Almost every major Division I and II school is represented here, with either a head coach or a scout posted along the touchlines. For our family and all the others in Oceanside, it’s been a journey. Along the way, we’ve asked ourselves: Are we those parents? Are we pushing because we want to win at parenting? The answer is no. We want our son to succeed and will do what it takes to nudge him on his way. He set the dream, he put in the work, we supplied the tools. But if we’re honest, we’re fatigued with the chase — knowing that, if we’re lucky, we would reap only a fraction of the scholarship dollars that basketball and football student-athletes get. Full rides? Not in soccer. With only 9.9 scholarships allowed per team, at an average of $16,199 per player, soccer players know that whatever money they get in scholarships might only make a dent in their final bill. We know Max has the talent. We also know he’s an even better student — 4.25 GPA going into his senior year, taking a number of Advanced Placement courses — than he is a goal scorer. But the questions linger: Is all of this sacrifice — the time, the effort, the money, the conference calls in the car — really worth it? And, most importantly: Does Max want this, or do we want it more than he does? If we’re honest, we’re fatigued with the chase — knowing that, if we’re lucky, we would reap only a fraction of the scholarship dollars that basketball and football student-athletes get. 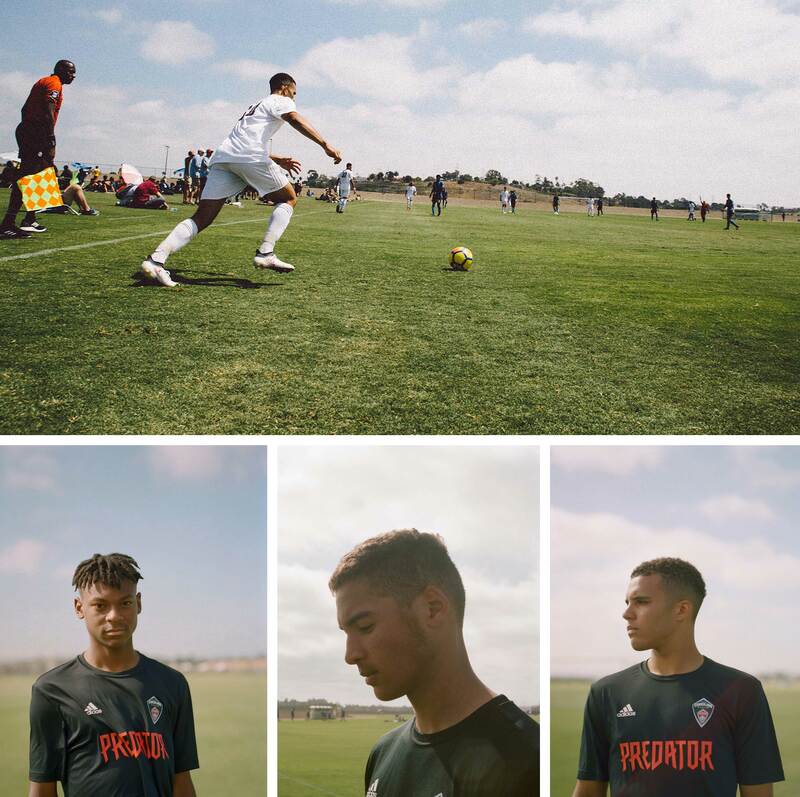 Clockwise from top: Sean Suber launches for a kick during the 2018 USSDA Showcase & Playoffs in Oceanside, CA, June 19, Sean Suber; Malcolm Walters; Max Wright. At a cost of $5,000 annually, the DA price is significant. When you throw in money for four nights a week of training and out-of-state games, that number easily doubles. DA players aren’t allowed to play high school sports. (When would they find the time?) But for any high school player who aspires to play in Division I or II, the DA is a near mandatory rite of passage. Founded in 2007, the DA is where college coaches and scouts come to see players play, starting as early as U14. Derek and Jeanne Suber, who live in Charlotte, North Carolina, have two sons. Their oldest, Taylor (everybody calls him TJ), just completed his freshman year as an engineering major at the University of North Carolina, Charlotte on a partial soccer scholarship. Younger brother Sean is a teammate of Max’s, and team captain. The Subers estimate they’ve spent upward of $40,000 for DA soccer for both sons. 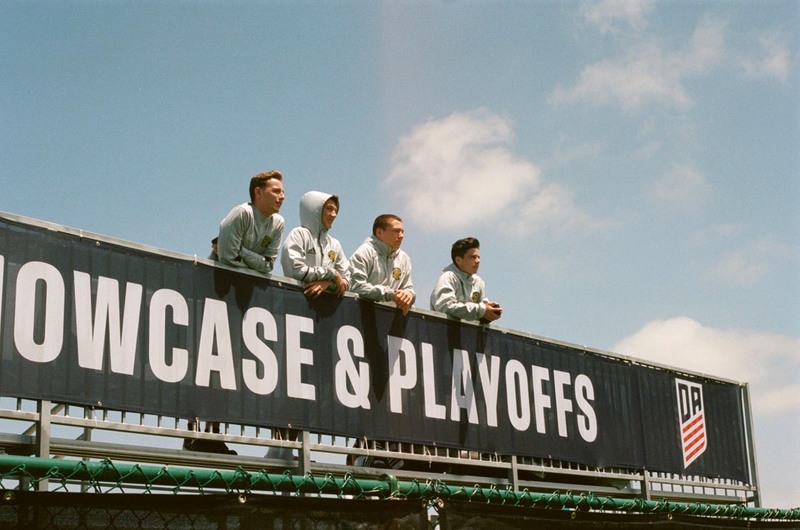 Four young men watch another game as they wait for a match to begin at the USSDA Showcase & Playoffs in Oceanside, CA, June 19, 2018. Max Wright performs a sliding tackle against the Montreal Impact during a Showcase Playoff matchup. “Pay to play” are three words that U.S. Soccer doesn’t want to hear. But the reality is that not all the athletes in this exclusive pool are great players. It’s also true that the player pool lacks diversity. The DA, which consists of 197 total clubs, composed of teams across six age groups in the boys’ program, does not keep racial demographic data. Max, Malcolm and Sean are three of five black players on their team’s 18-man roster. Eddie Johnson understands that — but also thinks we, as a country, can do better. A retired pro who has made 63 appearances for the U.S. national team and played most of his 14-year club career in MLS, Johnson, 34, came through the ranks when the DA did not exist. The Olympic Development Program, created three decades ago by U.S. Soccer to identify national team players early at the youth level, was his path to being noticed. “Our best athletes come from humble environments, and I’m not just saying black Americans,” said Johnson. “I’m talking about Hispanic players, Caribbean players, as well as white players that don’t have the means to play at the DA level. If we can cater to them early — at 6, 8 and 10 years old — we will see a higher number of African-Americans, in particular, playing soccer at an earlier age and we can get them involved and get them seen,” added Johnson. Several MLS clubs have fully funded academies where young athletes play tuition-free. Those clubs’ teams typically have the strongest DAs and almost always showcase a diverse roster. Why? Because they draw from a larger pool. As a parent who has spent what feels like a lifetime on sidelines watching games at this level, I can attest that when a diverse squad jogs onto the field, palms get sweaty. 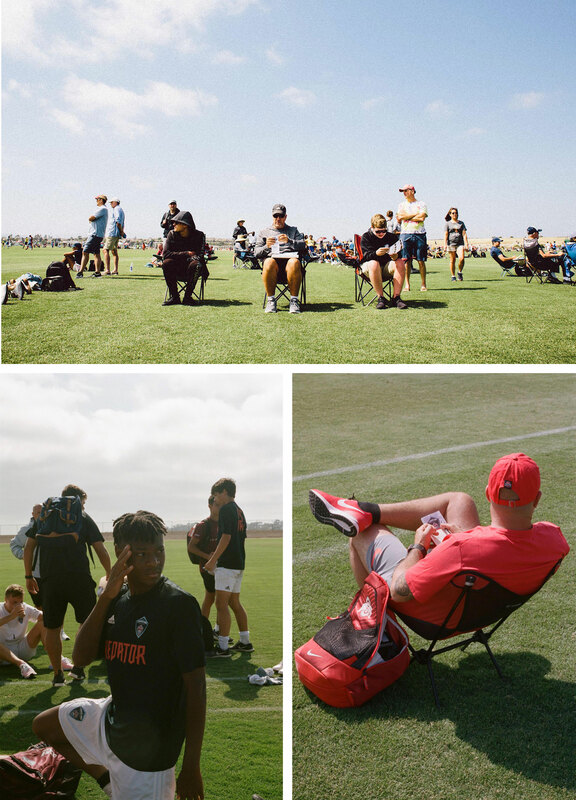 Scouts look at the program while watching matches and learning players names during the 2018 USSDA Showcase & Playoffs in Oceanside, CA, June 19, 2018; a scout watches as the Carolina Rapids play a match during the showcase; Max Wright gathers his belongings while watching another game after his match. It’s been a good year for Max, Malcolm and Sean. Collectively, the trio accounted for 19 of the team’s 57 goals — and helped the team gut out a 19-13-6 season, including going 8-1-1 over its last 10 games. The Carolina Rapids U17 DA team kneel in a team huddle, June 19, 2018, Oceanside, CA. Malcolm’s father, Emanuel, estimates the family has spent between $9,000 and $11,000 for soccer this year. He and his wife, Michelle, drive older-model cars — he has a 2000 Nissan Maxima, and she drives a 2002 GMC Envoy. Pushing older whips is just a small reminder of the sacrifice made. “Being in the academy, a bunch of my friends from school didn’t really [understand] what I was going through,” Max said. “They knew I was on an academy team, but they didn’t really understand really what I was going through every day: going to practice four days a week, having games away in Florida and Georgia every weekend. 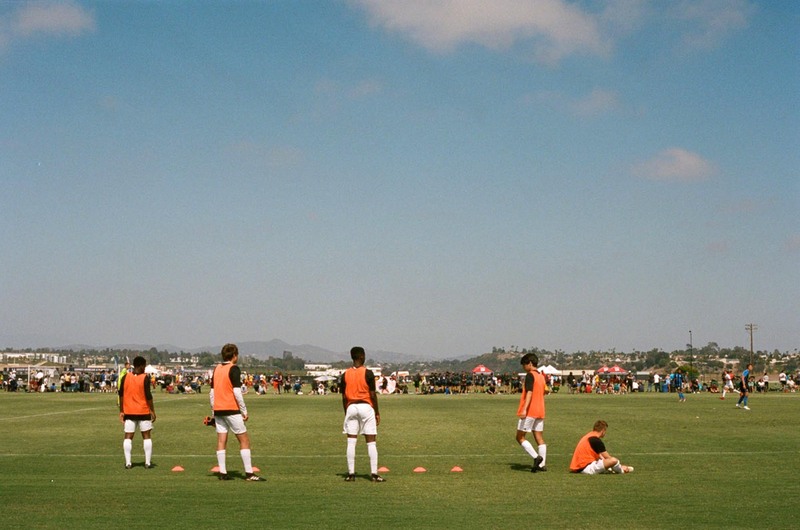 Five players from the Carolina Rapids U17 DA team stretch and stay ready to be called in as substitutes, Oceanside, CA, June 19, 2018. As soon as you walk into SoCal Sports Complex, the pungent smell of fertilizer hits you, aided by a steady breeze. “Pardon our (occasional) odor,” a sign reads near the entrance to the facility. “As part of our environmental efforts, the nearby mulch facility is transforming tree and shrubs clippings into re-usable ground cover.” The rich odor explains why all 22 of the fields here are World Cup-quality. Max and his teammates had three of the biggest games of their young soccer-playing lives here this week against some of the toughest teams in the country. Their first opponent, Montreal Impact, lets them know exactly where they are: good, but not yet great. Montreal’s mostly black, French-speaking side takes control of the game in the second half, winning 3-1. The Rapids’ second game comes against a St. Louis team, and Max breaks through the middle of the field with a top-shelf finish, putting the Rapids on the score sheet early. But a second goal doesn’t come, and the game ends in a disappointing 1-1 tie. By the time Game 3 rolls around — the boys knew they had no chance to advance to the national championships — they play a complete game, beating Players Development Academy 2-0, as Max adds to his goal tally with a tap-in header. L-R Sean Suber, Max Wright and Malcolm Walters of the Carolina Rapids, Oceanside, CA, June 19, 2018. Last February, 1,056 DA players announced college commitments. Most of those players were likely seen at SoCal Complex, where there seem to be more college scouts and coaches than fans, all looking for players. “Who’s No. 37 … he just entered the game?” a Yale scout asks a Rapids parent during the second half of their last game. “That’s Malcolm Walters — he’s already [committed] to UNC Charlotte,” comes the reply.